* Free 2-Day Rapid Replacement comes standard across entire product line. * Cross-Ship replacement - rest assured you won't be left in the dark. * Industry leading warranty lengths - all products range from 3 ~ 5 years. * Instant access to our experienced representatives - hold times are minimal. * Advanced troubleshooting techniques such as remote desktop come standard. 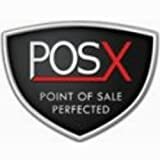 * Free lifetime technical support for all POS-X hardware. * Complete line of POS products are engineered to handle demanding environments. * No corners have been cut in order to achieve our great price points.